Can you be replaced by a vending machine? Fifteen short years ago that would have been a tongue-in-cheek type of question. Not any more. The dizzying advances in A.I. and other technologies is creating a looming reality for a lot of people who aren’t expecting it. And it’s going to happen to some people far sooner than they think. I had an interesting experience in a building supply store a few weeks ago. I hunted down a customer service person and asked where I could find 2″ x 1/2″ oak strips. He pointed to aisle nine. I found aisle nine and the oak, then hunted him down again to ask where I might find flat, thin steel strips. He asked how wide, I told him, and he pointed to aisle 24. Thinking ahead, I also asked him where I could find glue that would I could use to fasten the steel strips to the wood. He told me that aisle number too. It suddenly occurred to me that, with today’s technology, this customer service person could easily be replaced by a vending machine. (A gigantic vending machine, granted, but then again, isn’t that basically what Amazon is?). His job is at risk, and he doesn’t even know it. The big question isn’t so much how we are going to be replaced by technology, but why we are going to be replaced by technology. When you think about it, the only reason that we could be replaced by a vending machine or a robot is if it could do everything that we can. So… can these machines really bring the same things to the table as real people? There is one thing that machines can’t duplicate. Our humanity. The ability to create a real, visceral connection with other people. As good as artificial intelligence will get, it will never appreciate an inside joke. It will never be interested in you. It will never care. 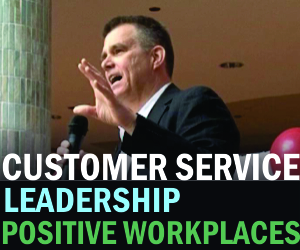 Caring about the people around us – customers, colleagues, employees and bosses – has always has been the differentiator that makes people successful. Never has it been a more valuable trait to adopt. The thing is – machines can’t care. We can. But if you choose not to care, then there is no reason for you to not be replaced by a vending machine. Think about my hardware guy. Imagine the difference if he actually cared about why I was there. “What are you building?” he might have asked. “That sounds really cool!” he might have said. “Have you thought about x, y,z…?” Imagine how much more enjoyable the customer experience would have been. That is what would keep me coming back, and that is the value he could bring – if he only chose to. A.I. is already impacting the job market. Chatbots and driverless cars are just the beginning. In the not-too-distant-future, it will impact doctors, lawyers, truck drivers and a myriad more occupations. Flawless customer service skills, people skills and a genuine caring about the people around you are the things that will make you stand out. Are you ready? Great post, Shaun, and a good warning to many employees. Just by coincidence, today was also the launch of a “pharmacy ATM” in Johannesburg for those needing chronic medication. The queues at state-run hospitals are legendary, with many ill patients arriving at 4:00 a.m. and only leaving 14 hours later after the sun has set. It’s a shocking state of affairs – but now, at last, there is some light at the end of the tunnel. Pharmacists are under threat. The YouTube video is here: https://www.youtube.com/watch?v=ImZ4aFeYJ9o. I think it was Virgil, writing a history of Julius Caesar, who wrote: “Ex Africa semper aliquid novi,” loosely translated as “out of Adrica there is always something new.” I’m not sure if this has happened elsewhere, but I’d love to hear from your other readers. Wow – this video is half awesome, half scary! Thank you for sharing!